Nearly 3 years ago, I went for a long ride on my motorcycle to the highest motorable pass in the world, Khardung La in the Himalayas. I was in a group of about 50 riders; all of us on our Royal Enfield Bikes. 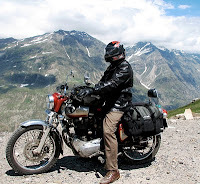 We rode from New Delhi to Leh and Khardung La via Chandigarh and Manali. On the return leg we went to Amritsar and the Wagha border. I do not recollect the faces of all my fellow riders. They were mostly youngsters in their 20s and 30s; a few in their 40s and at 50, I was the senior most rider. But there were lots of photographs and I see them all. A few days back I learnt that one of them, Naveen, died in an accident. I confirmed who he is in my album. I looked at his young face, the lean, macho looks, and the daredevil pose. He was from a group called the Roadshakers, in Pune. I remember him racing through the difficult, hilly terrain, standing up as he flew over the loose stones and rocks and taking curves at breakneck speeds. He was an expert rider. I do not remember reading the obituary column as diligently as I do now until in my mid-40s, when one by one, familiar faces started appearing in the column. Not with fear, but with dreary, weary apprehension, one listens to the tolling bells. For a few days after the news of his death, condolence notes used to appear in the Yahoo-group. Not all of us, mind you, just a few. In a couple of weeks, we too will relegate Naveen's memory to the backyard of our mind and after that, it might get wiped off. I look at Naveen's face again and wonder. I look at the faces in the obituary columns and wonder. I remember all those whom I knew and who had passed on. I look at the living, thinking that they too will die one day; so would I.
I am, as always, humbled by the vacuum that I see. Oh Balan sir you are reminding us of the ultimate destiny. All your posts has a got a message to convey. May Naveen's soul rest in peace. I just remembered a lady rider whom we met during Rider Mania. She was a member of Indie Thumpers - Mumbai. She too met with an accident last year. I lost a friend too, a batchmate doing rural service passed away last week. It was a bike accident, too. The lady that subu mentioned, how is she? @Gopu: She is no more, Gopu, she died in that accident. The accident we saw near Walayar en route Ooty is still very vivid in my mind. How a simple thing called a helmet would have changed the situation!